I was asked by the Gelinas middle school in Stonybrook, NY to make some props for their annual theater production. This year is it Tarzan. 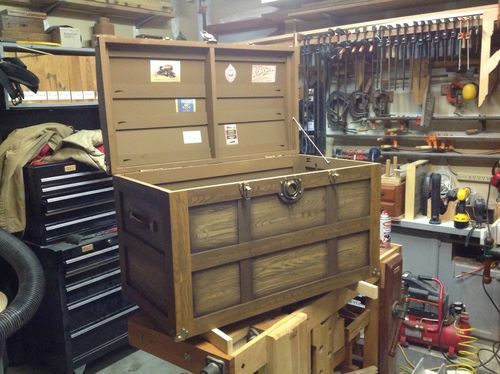 One of the props I had to build is a steamer trunk . Finding several old photos on the internet, I chose this style. It measures 36” x 20”x 24”. To keep the cost and weight down I decided to build this from inexpensive fir and Masonite for the panels and bottom. After a simple construction of stub tenon, pocket holes, and sliding cut Masonite panels into grooves in the frame it soon began to take shape. The curved lid was a challenge, but I did work my way through it and I was happy with the outcome. Now the fun began, finding hardware on e-bay, and some faux wood graining it now looked better than I imagined. The faux leather handles were the most fun. Cutting the shape from a scrap 2×4 I sponge painted the wood to resemble leather. With painted stitching and gold color cardboard escutcheons, it took on a reality of its’ own. Finally adding hardware and handles, it is ready for opening night. I enjoyed all the construction challenges as well the faux painting and creativity. Thank you Nancy for your driving encouragement. This trunk is light weight and strong enough to endure an ocean voyage or a ride on the Orient Express. So let’s take a trip Nanc. Wow, I help build props for my wife’s high school, and they never look anywhere close to that good. Nice work! That is great, cheap option for a lot of uses not only on the stage. looks great! hard to believe its just masonite on the panels! That is really amazing! Prop or not, it could sit in a room and be used. Nice job! The faux paint job is pretty amazing! Beautiful work, it looks authentic especially the wood grains and the handle. It’s a great props and creative build.